Starbucks: Goal – Soul. Bonus – Belly. Living in Seattle, it’s hard to escape two things – rain and Starbucks. Experiencing both in abundance and spending quite a good sum–money and time–at my neighborhood Starbucks on frappuccino, it came as a surprise when Starbucks lowered its forecast for 2008. One of the reasons for lowering of forecast is increased competition from McDonald’s and Dunkin’ Donuts. This raises the question – what is the best way for Starbucks to take on these two giants moving forward? I believe the best way is by sticking strong to their roots and concentrate on filling the soul. In the process if the belly is filled, that’s an added bonus. I recently completed reading Howard Schultz’s Pour Your Heart into It : How Starbucks Built a Company One Cup at a Time. Schultz’s very well defined the foundation of Starbucks i.e. making the local Starbucks as the third place for the people in the community after their work and home. Starbucks should make sure they do not loose their coffee bar atmosphere while tackling any competitor. That atmosphere is as integral to their brand as is the high quality coffee. Another important thing to note is that people do not come to Starbucks just for a cup of coffee, they come to get satisfaction of buying coffee in a store, where there is the perfect atmosphere to buy that perfect cup of coffee prepared by the cheerful (mostly) barista, or as Schultz put it, people come to Starbucks to fill their souls. Now let’s talk about the specific competition from McDonald’s and Dunkin’ Donuts. Starbucks cannot take on either of these two on price equation. McDonald’s is known for its economical offerings and has an edge over all its competitors in this field, Starbucks being no exception. In fact, we all know that Starbucks charges a premium, and that has become an integral part of the brand. As far as the rising cost is concerned, it is experienced equally by all the competitors, so I won’t bring that in this equation. 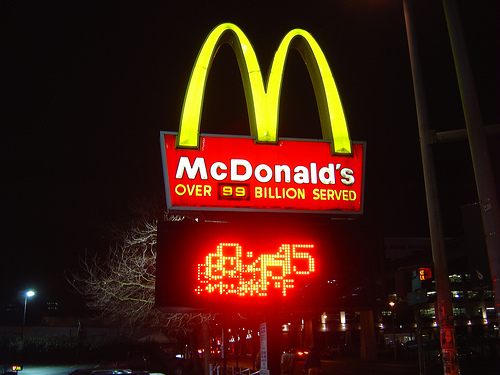 McDonald’s and Dunkin’ Donut are primarily known for their “not so healthy” food. Fat rich offerings at both these places are not the first choice for the health conscious customers. That creates a perfect opportunity for Starbucks to play the health card! Starbucks has always created that perfect third place atmosphere for its customers. By offering healthy food for breakfast with the cup of coffee will provide Starbucks the opportunity to make it the one stop shop for customers in the morning, rather than hopping to different places for coffee and breakfast. Selling point – they are having the best coffee with a healthy meal. The basic point to understand here is that people do not come to Starbucks to buy the panini sandwich, they come there for the cup of coffee, but while getting that cup of coffee, if they can get something healthy to eat, they would appreciate that as compared to eating that thousand calories breakfast with a not as good cup of coffee. Howard Schultz and Ray Kroc are two great entrepreneurs behind two of the most identified American brands, Starbucks and McDonald’s respectively. I love long plane journeys, one reason being that I get to catch-up on my reading. During my most recent trip to India, I picked up Pour Your Heart into It : How Starbucks Built a Company One Cup at a Time authored by Howard Schultz. This is one great book. (One thing to learn from Howard Schultz apart from his entrepreneurial skills is the art of story telling…) Coincidentally, during my last long plane journey (to Milano, Italy), I was reading Grinding it Out: The Making of McDonald’s by Ray Kroc, another book that falls in the same autobiographical league. The two autobiographies have some amazing similarities worth talking about. First, both were believers. After his first visit to the single McDonald’s store in California, Ray Kroc knew that this is going to be something bigger than what anyone can think of. He believed in the concept of McDonald’s and had the drive to spread it beyond boundaries more than anyone else, even more that the McDonald brothers running it. Similarly, Howard Schultz was impressed by the coffee bars he saw in Milano, Italy. He believed that Americans should start enjoying their coffee experience and became a preacher of serving hot coffee in the once retail-only Starbucks stores. Their belief powered by persistence through all the ups and downs led to the formation of these two global brands. Second, neither one of the two started the first store of what they are known for. Not only this, both of them were suppliers to the stores they later converted into big phenomena. Ray Kroc supplied juice mixers to the original McDonald’s store in California and Schultz supplied appliances to the Starbucks stores in Seattle. A slight difference in approach over here, Ray Kroc signed a deal with McDonald’s owners to use their name and concept to open similar stores elsewhere, while Howard Schultz joined Starbucks as a marketing manager, left the company to open coffee joints under the name of Il Giornale, bought Starbucks and became its CEO. Third, both were obsessed with the names. Kroc went through series of issues with the McDonald’s founders but stuck with the name and the famous M curves. Ditto for Schultz. He opened his coffee bars Il Giornale, but liked the name Starbucks so much that he renamed all his already running Il Giornale stores after acquiring Starbucks. Fourth, both left stable jobs to chase their dreams. Kroc was selling mixers when he came in contact with McDonald’s. Within weeks, he was on plane with deal papers to start his journey. Schultz decided to quit his well paying job of $75,000 a year in 1980 and took a big pay-cut to join Starbucks. Fifth, both were staunch believers of quality. Starbucks is known for its quality, and Schultz developed the entire enterprise one store at a time keeping the quality intact. Till today, Starbucks does not compromise on the quality as far as possible. They do not add flavor to the beans, or sell low quality beans in their stores. Starbucks, since its inception has a 40 hours training program for its baristas to serve the perfect cup of coffee. If McDonald’s is known for one thing, its the fries. McDonald’s got a perfect process for preparing its fries and they have not compromised on standards there even a little bit. There’s a complete university like program for the employees at McDonald’s for decades and every person working in McDonald’s goes through this program to maintain the McDonald’s quality and service standards. Sixth, like any other successful entrepreneur, both Kroc and Schultz pioneered the unique quality of building and leading great teams. Read their autobiographies and you will find chapter after chapter in praise of the people they worked with and the great folks who embarked on the journey with them to lay the foundation of their respective enterprises. These two individuals, role models for many budding entrepreneurs, and the similarities in their approaches endorses the importance of persistence and people management among other things. A look at one big difference between the two can be interesting as well. Howard Schultz started his first coffee store operation when he was 28 years old. On the other hand, Ray Kroc started his first McDonald’s when he was 52. If nothing else, this definitely proves that age is no barrier to kick-start something you believe in…all you need is a dream and the vigor to chase it!